Navigator SMS Pipeline Project stretching from Calumet in Canadian County, through Kingfisher County and eventually finishing in Cushing in Logan County. The paperwork describes this as phase 1. The image is a preliminary plan showing the route. As with most proposed easements there are onerous terms that can prevent the owner from building ponds, changing grade, planting trees or shrubs. They also ask the owner to warranty title. So far, materials have not claimed that Navigator has the right of eminent domain for this project. As in all such cases, if an agreement is reached, there will be a one-time payment and no opportunity to re-negotiate the terms. Don’t be Afraid to Say “NO” to the Initial Offer. 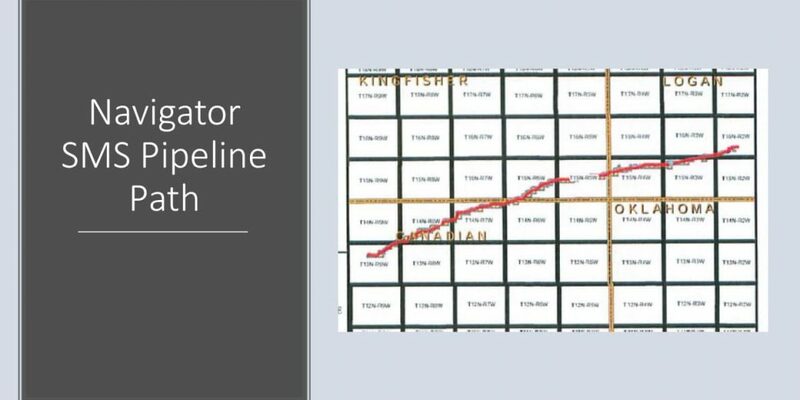 In a similar pipeline project, another company paid a range from $180 to $745 per rod with an average of a 50 foot easement. The price obtained depended upon the nature of the property and the negotiation skills of the landowner. What if They Claim that My Property can be Taken by Eminent Domain? Even if the company has the ability to to use Eminent Domain, you as the the landowner have the Constitutional Protection under the 5th Amendment for just compensation. Your property cannot be taken without compensation even if you are taken to court. Often the initial offer is not the best deal in these types of situations. What is the going price for a rod, Click Here?